Happy Birthday Queen Victoria-Book Review + Giveaway!! This book is a blast! It`s a quick, fun read that describes some of the strangest things the Victorians thought up, or implemented to get by their everyday lives. They used charcola as a teeth whitener and when their teeth got really bad they bought tetth from those who sold theirs to get by. Victorian wome wore as many as twelve items at a time. The corsets women wore were so restrictive that they swooned quite often- so rather than stay home for being so delicate, they simply had a rib removed! There are so many strange things in this book varying from areas of domestic functions, foreign affairs, social graces, curious cures- just to m=name a few. 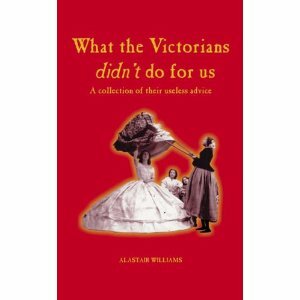 I loved this little book (a mere 126 pages) for its most interesting look at the ways of the Victorians- so much info! 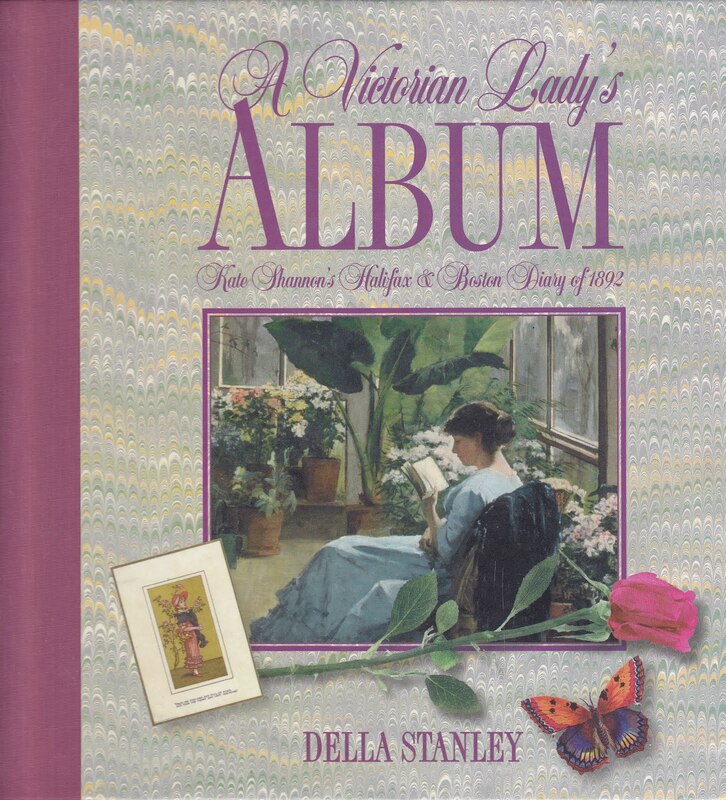 And after reading this, even though I love Victoria, I have to agree that not all that`s often good necessarily stems from the Victorian times! This is such a precious book! It`s filled with letters, photographs with handwritten mementos, theatre stubs-In a few words: it breathes with Victorian life. If you are interested in reading this type of beautiful memoir- this is the book for you! so that you can enjoy the history and gorgeous art collection (gold, statues, paintings, artifacts, icons, even dolls! and much more). I`ve got a huge Victoria Day Weekend fest happening over at my history blog, with posts, reviews and giveaway. So, in honor of this Royal Queen`s birthday on the 24th, I decided to draw her! It`s day 3 of the Queen Victoria Long Weekend! Sorry I didn`t post earlier...it`s been a scorching hot day here in Montreal and we`ve been soaking up the sun and Barbecuing and feasting! 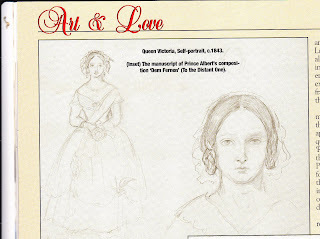 Today`s post is mainly about Victoria and Albert`s love of the Arts. It`s no secret that the Royal couple indulged in the arts; whether it was music, poetry, painting or the theatre. 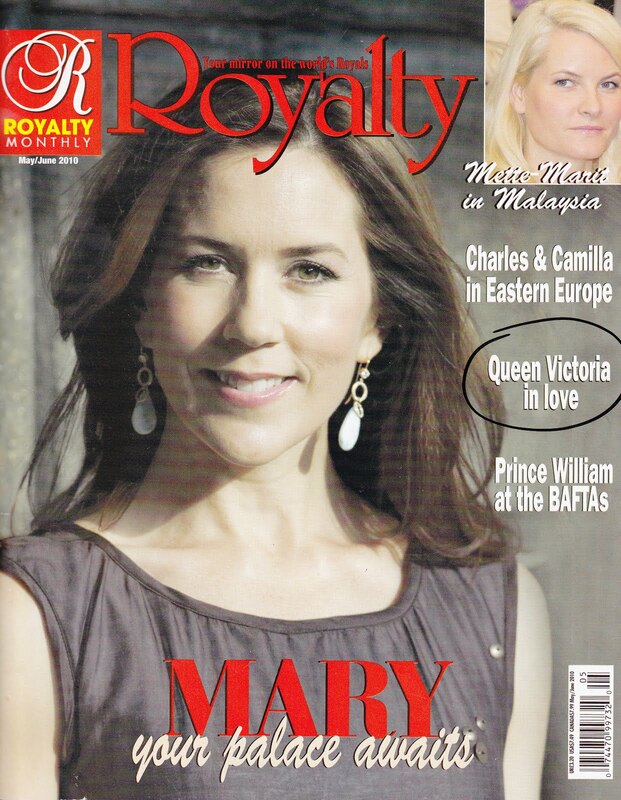 This month, I came across a copy of the magazine, Roylty (which I love!) And found a whole section on Victoria`s love of the arts..Notice the black circled section on the right for the title..
Here`s one of of the royal family- I simply adore this one! 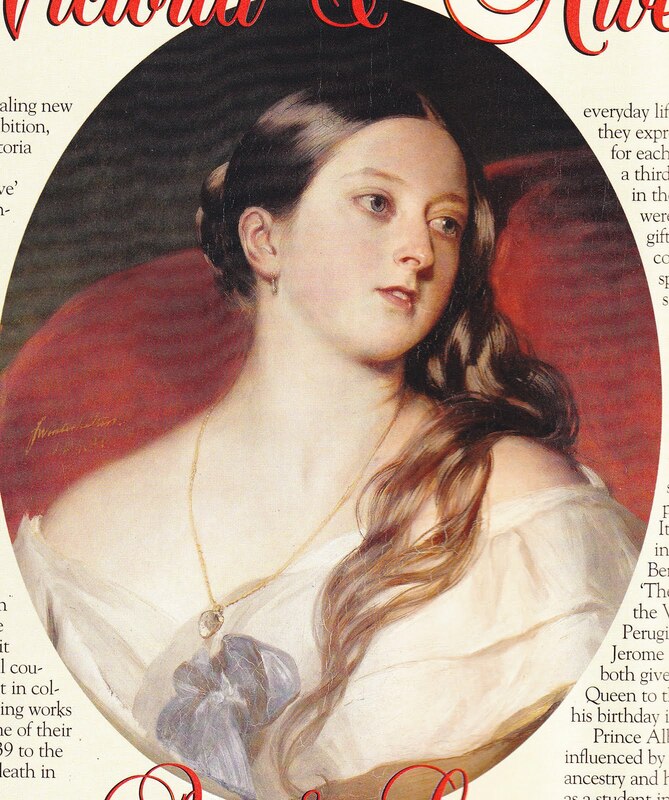 And this last one was Albert`s favourite painting of Victoria (and I don`t blame him!) Look at how deliciously gorgeous she was! 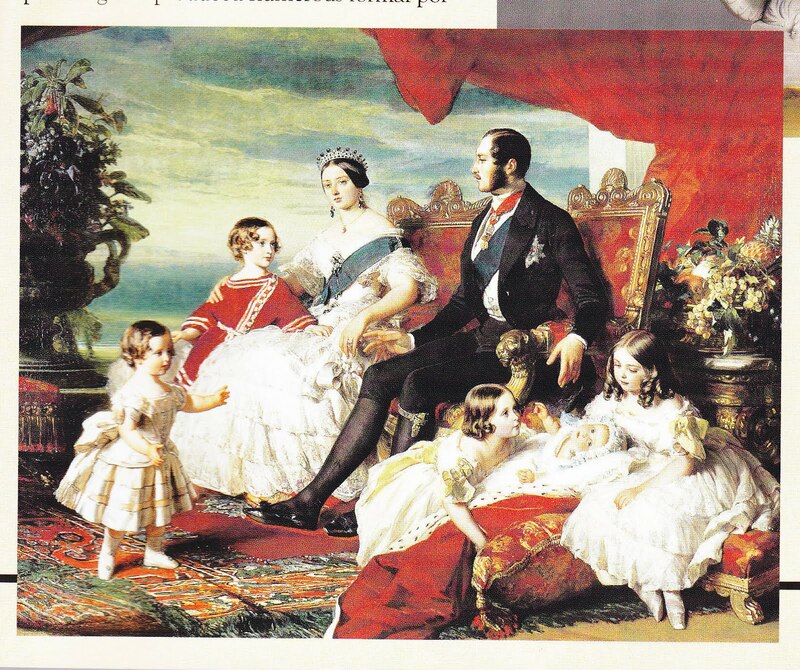 Do you have a favourite Victoria painting? Leave a comment and let us know! 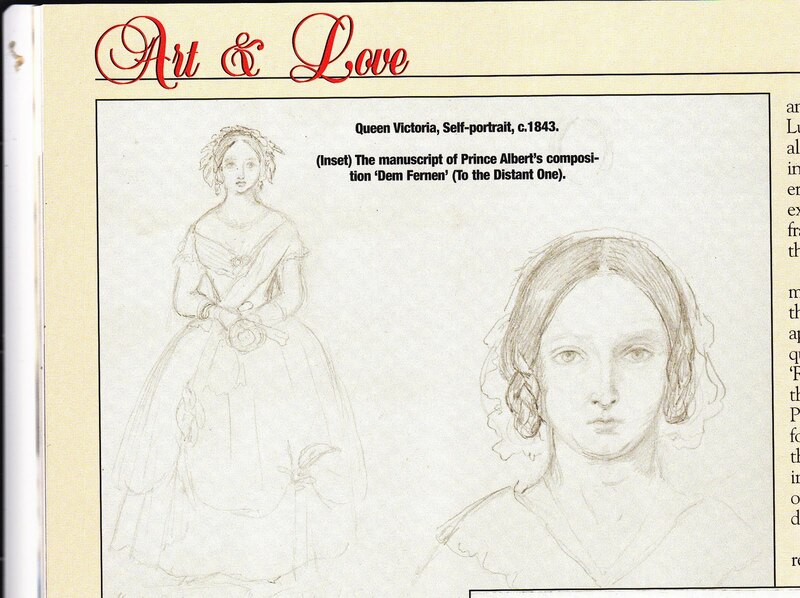 Remember to tell us what books you have read on Victoria, her art of love, or anything else Victoria-related. Come share your links, thoughts and comments below. To check out what others have linked and shared so far, please see Here. Day 2 of the Queen Victoria Long Weekend!!! 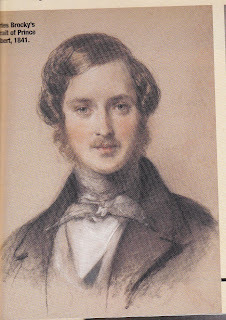 I recently was given the privilege of borrowing a very old but beautiful copy of : QUEEN VICTORIA. HER GIRLHOOD AND WOMANHOOD, BY GRACE GREENWOOD . After reading it with the utmost care (seriously, because it wasn’t mine, I feared if anything should happen to it- yep- that precious and antique! )- only after did I discover that I could have actually read it on the Gutenberg Project! See Here. This beautifully written biography tells the story of Queen Victoria, her family, her life, studies, love of the arts, the famous people she met, the politics, her endless love for Albert (reciprocated of course;)...It is an absolutely divine read. I think what I loved most was reading the descriptions of the Queen as a young child all the way through to young adulthood. She had the kindest disposition and was such a caring person. It seems that everyone adored her. Reading about her affinity for the arts and her love of animals reflected her gentle character. I loved reading about her mannerisms and the way she dealt with others. Of course, her relationship with Prince Albert was the kind that fairy tales are made of- and that suited me just fine as well. There’s even a part where she entertains Napoleon III and his wife, Empress Eugenie (whom I happen to adore). The Queen and the Empress really seemed to hit it off- both with such endearing personalities, I could really picture the two of them together. When in turn the English Royal Couple visited their French counterparts, it is said that they had a grand time; they enjoyed eachother’s company so much that the Empress cried when parted. The book ties in the history in such a splendid way by sweeping us through the lives of this royal branch (from George III and on). I loved reading little anecdotes on the family dynamics and peculiarities of these historical royals. But the saddest part was certainly Albert’s death- and with this the part where Victoria, with such sorrow, realizes “There will be no one to ever call me Victoria again”. 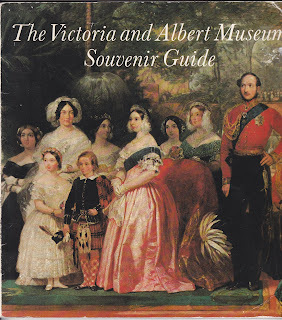 If you get the chance read this splendid history book on Queen Victoria- you will love it. What books have you read on Victoria? Come share your links, thoughts and comments below. Come Join The Queen Victoria Long Weekend Binge!! 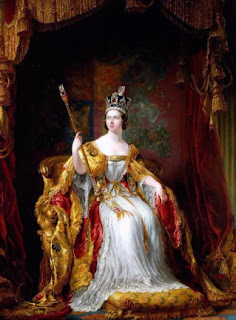 In honour of this great monarch (who’s birthday is on Monday, the 24th) I’m planning a big Victoria Long Weekend Binge here on EBJ. 4 days of posts on this grand Queen! And a Giveway on Monday! I’m inviting all my readers and blogger friends to come along and post your review links (of books, movies, art...) past and present in the comment sections of my daily posts. Tell us what you`ve been reading- or anything related to Victoria:) I know that I`ve read tons of great stuff from your blogs- and so I`d love for you to come by and share! I’ll begin my first day of this long weekend by telling you that I watched The Young Victoria and absolutely loved it! The royal couple was divine and so well suited for their parts. I particularly loved the period costumes as well. Have you seen it? Hope you join along- thanks! A Wonderful Blog Anniversary and GIVEAWAY!!! Do you know that terrific creative gal over at Contain-It- her name is Roberta? 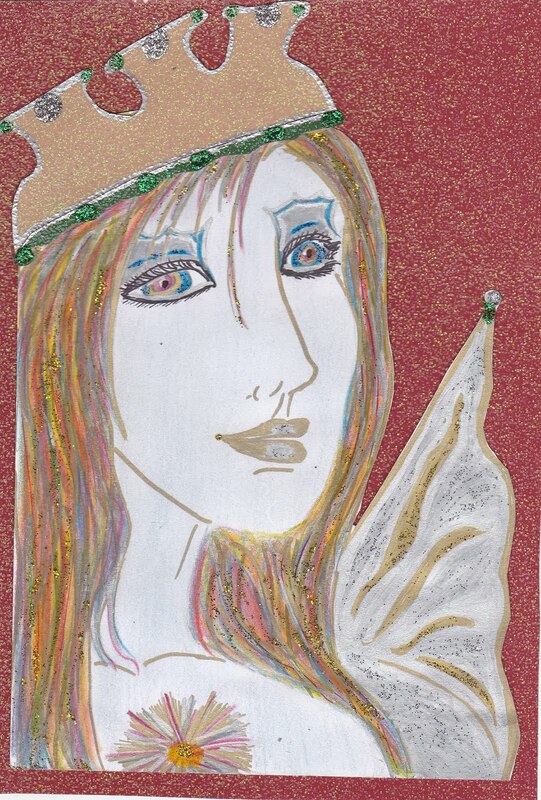 Well if you go over to her site you can enter a wonderful and original Giveaway!!! 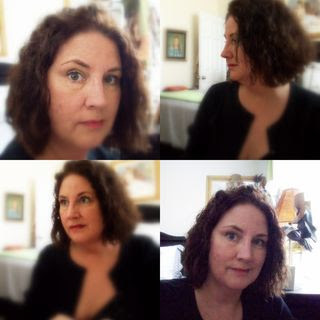 Her blog is great; always filled with imaginative ways to re-decorate, create, read, write, review, cook, inspire- you name it-she does it! Go check out her site, meet her, read up her stuff and of course- ENTER her GIVEAWAYS!! 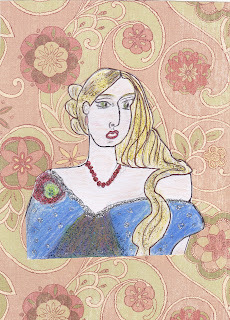 And as some of you know, I'm working on an art journal which includes all my French Historicals Oh-La-La! Challenge reads. I've been drawing several sketches for this art journal- (and I promise to show you some of this art by blogging about this very soon)- but for today, in honour of this great book and the Gortner HFBRT Event, I'm posting my drawing of a young Catherine de Medici. 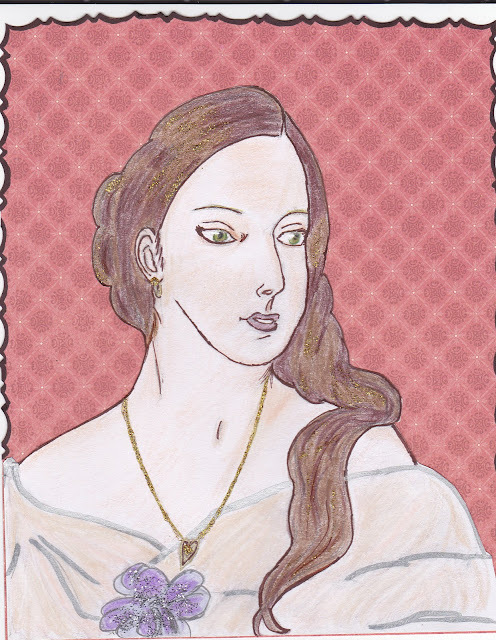 Here’s Catherine as a teenager...still so young, yet off to be married to the Dauphin of France (would soon to-be, Henri ll). The art journal itself is actually part of the Review journal challenge back at my friend Roberta’s place: Contain-It. I’ve put together a few pictures for my journal which I’ll upload sometime next week to show you my progress. 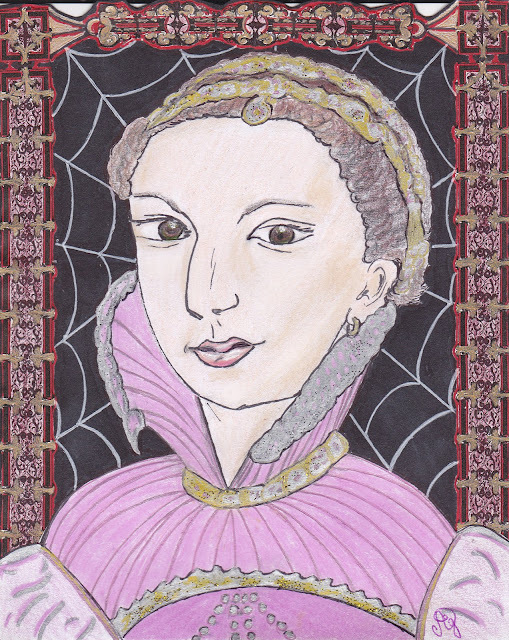 But today, I'm posting Catherine de Medici that I’ve drawn for the book I just finished reading: THE CONFESSIONS OF CATHERINE DE MEDICI, by C.W. Gortner (you can read my review here). This is a wonderful book- and if you’re interested in reading more about the whole fabulous event and to join some great giveaways- go check this out. Here’s Catherine as a teenager...still so young, yet off to be married to the Dauphin of France, soon to-be, Henri ll. 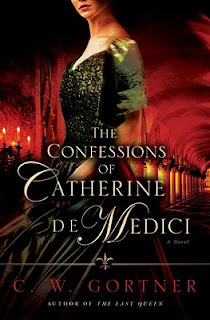 THE CONFESSIONS OF CATHERINE DE MEDICI, by C.W. Gortner is by far the clearest, out-of the box-take on this usually overly vilified queen of France. This in depth biography-type novel reveals a Catherine that not many people know- and that in itself is incredibly original as well as refreshing. The Catherine in Gortner’s book has been researched to the max- and although the author took the liberty of slightly altering names and events for creativity and flowing purposes (this merely avoided the encumbrance of an historical index of names appearing just for the sake of accuracy- and I appreciated that! ), the history is impeccably spot-on. Bravo for a novel that stuck to its essence while bringing us so much more! How can this Catherine be so different? Well, for one, THE CONFESSIONS OF CATHERINE DE MEDICI , portrays an all-around complete Catherine; woman, mother, queen, lover, friend , ruler, patriot, and ultimate monarch. The emotions alone, that each of these roles entail are enormous and not always easy to convey in a novel; especially when written in the first person. Magically, Gortner achieves this to perfection. Is it possible to love Catherine, when history has done everything possible to morph her into an absolute monster? When you read the how’s and why’s of Catherine’s actions, you begin to understand the person behind the story. It’s often easier to hold on to shock images that create an impact effect rather than to delve into the intricacies of the history itself. After reading Gortner’s magnificent novel, I understood the history so much better. The details in Catherine’s life, France, her children, the political situation, the religion!- all in flawless account, like layers of a collage with Catherine woven into its web, this story opens up a whole new dimension into France’s ruling family of the time. And, if after reading this novel you still can’t find it in you to love Catherine- I guarantee you’ll begin to sympathize with her in ways you’ve never imagined. So many facets to this woman: Catherine was headstrong for her nation, yet showed vulnerability in the face of love. She kept strong for her husband and endured the belittlement and embarrassment caused by his mistress and that whole awkward situation. She arranged marriages for her offspring with the nation in mind- yet had immeasurable love for them and an acceptance of their choices which was unparallel of her time (Her love for her son, Henri, poured unconditionally-beautiful!). Catherine had an uncanny foresight for great things, but sadly never had anyone to completely share her own doubts, needs, fears and- love. The enlightenment that no religion should divide a country and that France was all her people, not only Catholics-this too was grand. I have to admit that I never truly believed the Jezebel portrayal, so I was especially glad to read this fantastic novel which revealed Catherine as a woman of immense substance. I now see Catherine as a woman and ruler who sacrificed all for the ultimate good of France- a huge responsibility which she took charge of with all her might. Her focus never deviating from her purpose –no matter the cost. “...I’ve had ample opportunity to reflect on this unseen entity who guides our path and to ponder why he has seen fit to test me so. Have I not struggled as much as any other for my blood? Others live fewer years; accomplish a mere fraction of what I have; and yet they sit enthroned with halos about their brows, while I sink like a villain in my own calumny. As I wait the inevitable, I see the dead...my sometimes enemies and accomplices, each martyr to their cause. Important as they were in life, through death they have become legend. And I ask myself, What legend will history inscribe for me? Read Catherine as you’ve never read before – It’s time history got a dusting-Thank you C.W. Gortner for polishing it to a shine. Catherine de Medici's Gift + NOSTRADAMUS Giveaway!!! Catherine de Medici believed she had a ‘gift’...Oh, but not the kind you and I would delight in receiving. Her gift came upon her suddenly (not in the excitedly surprised- kind of way though). It made her ill, wobbly, anxious and often feverish...You could say that rather than joy, her gift delivered tragic results. From a very young age, Catherine could ‘see’ things in her future. These sudden visions would bring about fever and convulsions, and mostly fear. Catherine gradually had no choice but to accept that there was nothing she could do about her ‘Gift’ except use it as a forewarning of future devastation. we are presented with two of Catherine’s most important seers. The two men were of very opposing minds and methods ever: Cosimo, the evil and NOSTRADAMUS, the pure. Both of these men helped Catherine in different ways. Cosimo brewed potions for childbearing, attractions, pain and poisoning...On the other hand, Nostradamus cured, restored and predicted royal ascensions, downfalls and tragedies. Up until their death, both of these seers remained true to the root and nature of their abilities. (If you read Gortner's book , you’ll understand what I mean by this). At the time, (strategically convenient), Catherine did not see this dabbling as heretic or as contrary to her Catholic beliefs. In fact, she believed that everything she searched for in terms of predictions and cures was for the ultimate good of France, her people and her family. To her this was a necessary evil that bore no other choice. NOTE: This post ties in with Heather's Creative Post on Nostradamus, at The Maiden’s Court, Please check it out to find out more about Nostradamus. You will love it! 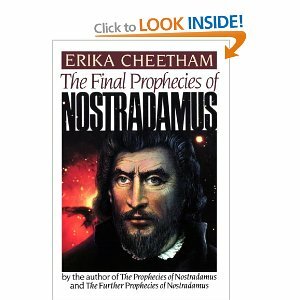 THE FINAL PROPHECIES OF NOSTRADAMUS, by Erika Cheetham, to a lucky winner!!! 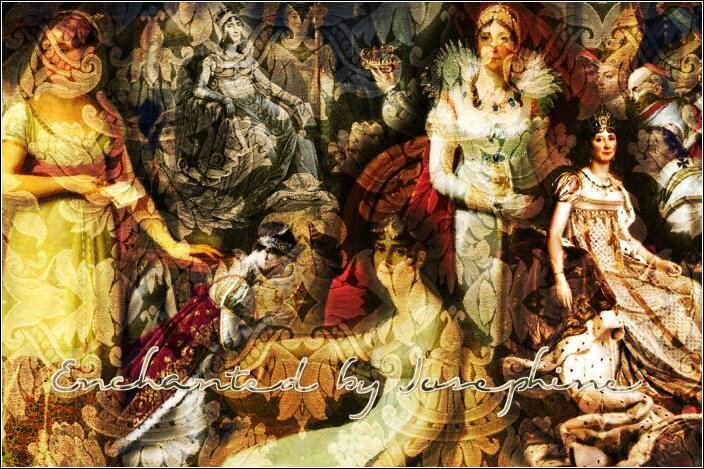 1-You MUST BE A FOLLOWER OF BOTH: Enchanted by Josephine and The Maiden’s Court. Canada- US only. Winner announced May 17th. C. W. Gortner is HERE! This week at Historicsal Fiction Bloggers Event we are hosting the Grand C. W. Gortner Event! It took several weeks to get my new gowns fitted. In the meantime I began practicing my riding every day on a docile mare, using my Florentine saddle, which had a higher ridge and shorter stirrup length than customary in France and thus, Madame d’Etampes informed me, allowed me the extra advantage of being able to hike up my skirts to show off my ankles. “You do have lovely legs, my dear,” she remarked. “And the gentlemen always appreciate a hint of thigh.” – Excerpt from The Confessions of Catherine de Medici © C.W. Gortner 2010 . Popular history has painted Catherine de Medici as the perennial evil widow—the notorious queen mother who poisoned her foes and wreaked havoc upon France. Of course, history rarely tells us the whole story and Catherine’s is no exception. Still, the legend persists, and so we see Catherine enshrined forever in her unadorned black skirts and veil, a reptilian being without any glamour. We tend to forget that in fact she was once a pretty girl— thin, with the Medici’s slightly protuberant eyes, long beautiful hands, and, it was said, thick, curly auburn hair. She was not unattractive by our modern standards; though in her day, when willowy blue-eyed blondes were prized, she was never described as a beauty. Still, she had spirit and, most importantly, she had intelligence and a formidable education. A true product of the Italian Renaissance, she could speak several languages, read and write (in an age when literacy among women not of royal birth was a rarity, not the norm); and she imported with her to France the seeds of a cultural heritage that continues to flourish today. It’s almost impossible to verify the claim that Catherine first brought pasta to France, though dried pasta was a staple in the 16th century for sea voyages. However, we can safely assume that if she did bring pasta, it wasn’t served in its most popular Italian incarnation, seeing as the first recipe for pasta with tomatoes was written in 1839. However, Catherine did import several other interesting devices, and her patronage of the arts made significant contributions to the French Renaissance and the world at large. Like every well educated Renaissance person, she believed forces beyond our comprehension shaped the world; in particular, she was a firm believer in the power of astronomy and astrological influences. The French seer, Michel de Nostradamus, shared her belief and he dedicated many of his quatrains to her and her husband Henri II. She in turn patronized Nostradamus, safeguarding him and his rather unorthodox practices from the ecclesiastical authorities. Without Catherine de Medici’s protection and support, we may never have had the opportunity to read the visionary prophecies of Nostradamus. Catherine was an avid art connoisseur who re-modeled the Louvre to house her vast collection. She was following in the footsteps of her beloved father-in-law, Francois I, whose obsession with purchasing art—in particular Italian art—is responsible for the Louvre’s housing of such masterpieces as Leonardo da Vinci’s Mona Lisa and Madonna of the Rocks. After Francois’s death, his collection languished in various palaces including Fontainebleau; under Catherine’s guidance, the art was protected ad preserved. In the same vein, Catherine had a keen appreciation for portraiture—a direct reflection of her humanistic education, in which the secular individual assumed vital importance. Under her patronage, the school of Clouet and others created astonishing images of some of the most important people of the age, including Catherine’s own children, allowing us centuries later to bask in their vivid, almost photographic likenesses. 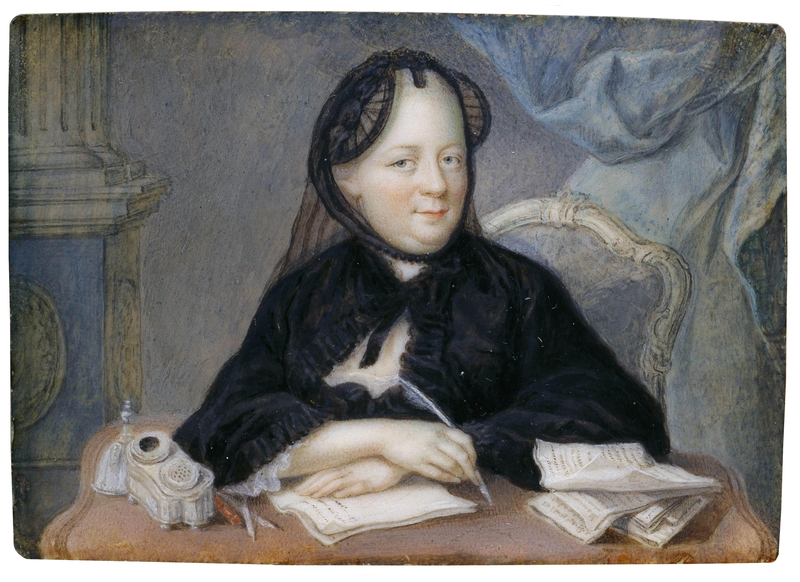 Her patronage of artists continued throughout her life; today, much of Catherine’s collection of portraits is on display in the Musée Condé, in the Château of Chantilly. Architecture was another lifelong passion of Catherine’s, one in which she reputedly indulged rather wastefully. It is unfortunate that so little of her original architectural projects remain. Her chateau at Chenonceau, surely one of the most beautiful palaces on earth, bears testament to some of her work, including the gallery spanning the Cher River and sumptuous gardens. Another of her extant surviving projects is the impressive tomb she had built for herself and her husband in the mausoleum of kings in Paris’s Abbey of St Denis. It is sad to contemplate that the tomb now stands empty, as the royal skeletons were removed from the Abbey during the Revolution and tossed together into a common pit. Catherine collected books and reputedly amassed a significant library, amongst which were several important treatises on nature and the occult. She was an amateur poet and patronized poets liberally at court, including the famous Pierre Ronsard, whose verses evoke the era so beautifully. Under her guidance, the theatrical scene of the era was enlivened, as well, with many court events including plays and other forms of stage entertainment, setting the scene for the Sun King’s later extravaganzas. Perhaps most fascinating, however, are the smaller contributions she made: Catherine is believed to have imported the first artichokes to France, as well as the first example of the modernized side-saddle. She was also the first documented user of female undergarments in France— which, if true, indicates that before she arrived, the ladies went commando under their gowns. It does make one wonder just how Catherine went about introducing the benefits of underpants to the ladies! Wasn't this AMAZING?! Thank you C.W. Gortner, This has been such a pleasurable read. Please be sure to check out the fabulous GIVEAWAYS, Guest Posts, Reviews, Creative Posts and other fantastic happenings this week, by checking The Calendar of Events back at HFBRT.